Alright, you guys: let's hear it. Valentine's Day is only ever the best or the worst and never anything in between, am I right? There are the lovers (yes, quite literally) annnd the haters, and I guess if I have to pick a side, you'll find me donned in pink and red. Maybe even Cupid-like wings, who knows. Simply stated, I believe love is worth celebrating, no matter where you find it. Since this could easily turn into a debate for the ages, let's move on to something we can all agree on: breakfast, of the French toast variety. YUM. Now, French toast has been a bit of a challenge in our household as of late. Seeing is how cute Colin has abandoned all dairy (which really just involves me cooking a dairy-free meal for both of us, serving his plate and then topping my own with, say, cheese), that removes the two traditional ingredients needed in order to prepare French toast: eggs and milk. Bummer. What to do? Giving up this particular breakfast item clearly not being an option and having had one tried-but-failed attempt to recreate the magic using only non-dairy milk as the custard base that resulted in a sad, soggy mess, I took to the trusty internet to find my answer. The internet hardly ever fails us. It's true. Say what you will, but I have been able to Google almost anything and at least, even if I don't happen upon an answer, I am able to discover that someone else was wondering the same exact weird thing. 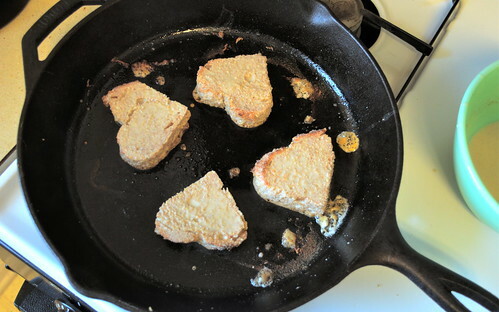 And as it turns out, lots of people were on the hunt for a vegan French toast recipe that was sneakily vegan. You know what I mean; no weird flavors, no obvious missing notes. 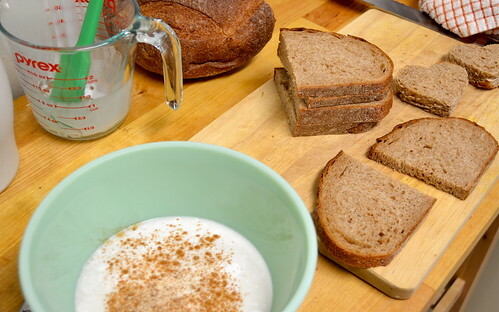 Vegan French toast that will make people say, "Wait, there's no egg in this? Seriously?" Seriously. 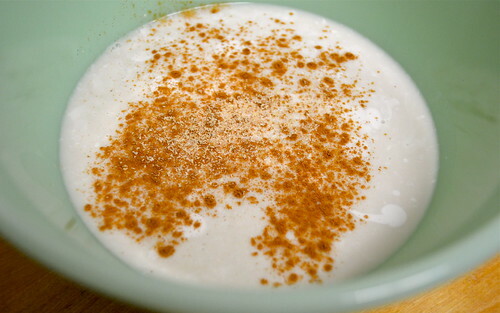 In a medium bowl, whisk together your coconut and almond milk, maple syrup, rice flour, yeast and spices. As I mentioned above, the nutritional yeast (most easily found in the dry bulk goods at your local grocery store) smells ... odd. But it's the key ingredient here to creating that faux-eggy (exactly) texture that French toast is all about. So stick with me here. It will be amazingly worth it in the end. 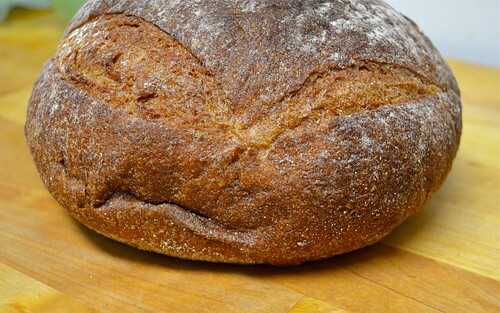 If your bread isn't quite stale enough, giving it a quick toast to create some crustiness will do the trick. 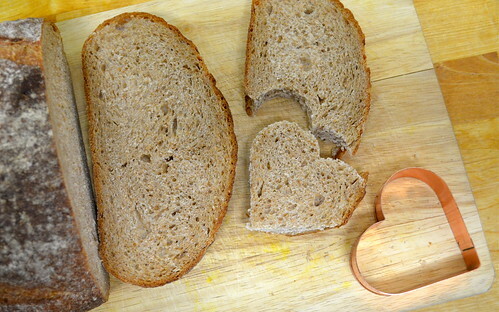 AND, if it is Valentine's Day or your are feeling particularly lovey-dovey, you might take this moment to cookie-cutter some of said bread into heart shapes. You know, for additional cuteness. 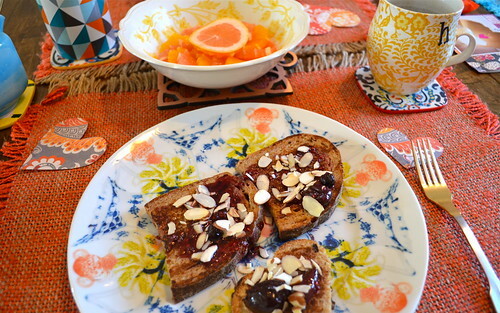 Once all of your bread has been fully French-toast-transformed, serve with berry syrup or topping of your choice. I admit, I was seriously surprised by the outcome. I thought it would be good, but surely had no shot of tasting like the real deal. Well, consider me humbled and completely incorrect: it did. I mean, who knows what else we can do by omitting the eggs? If we can still pull off things like magical French toast and chocolate chip cookies, will this become a dairy-free household in the end? No way: Cheese, people. Cheese.